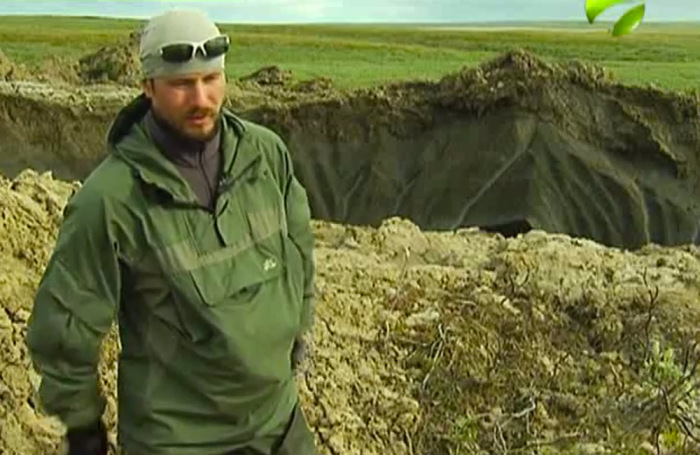 The internet is buzzing about the mysterious giant hole that's been discovered in Yamal, Siberia, a peninsula known as "the end of the world." Answers are hopefully on the way as an expedition team has now arrived at the scene. While scientists believe an underground explosion may have created the hole, a reported thick layer of permafrost around its edge should have melted during such a blast. In all, the crater's origin is still a mystery. This Russian news footage shows the scientists at work around the hole. And of course they lowered a camera to see what's inside.